This tank is awesome. It's super easy to build on and the lifted posts are awesome for juice flow. Nice big tank, *massive* juice fill slots, and despite being 25mm it sits nice on my Smok Alien mod (with a silicone case). So far I've only done one build (dual coil, running at 0.448ohm) but the flavour is awesome and it chucks a good amount of vapour. The airflow control is excellent - it clicks into place at certain intervals (5 at the bottom, 3 at the top). I haven't tried the second cap without the airflow, but it's cool that it has that option. Oh and the silicone plug for building single coil decks is great too! Honestly, if you're looking for a versatile RTA with a large juice capacity, get this one - you won't be disappointed. A good capacity at 5ml. Not the biggest, but big enough for most users to last a decent amount of the day between fills. This RTA has huge airflow, even if you don't use the top airflow. I personally use the closed top cap, as it has enough bottom airflow to satisfy almost anyone. The construction is first class, no sharp edges on anything, and one quick was was enough to get it ready for use. Comes with a spare glass tank, two choices of top caps (one with extra airflow, one without), the tools to change the coils, and a selection of o-rings to replace any that get damaged. You have to be careful when wicking to ensure that you don't touch the airflow holes with the wicking material, to prevent leakage, but otherwise, it's a great tank, and a significant upgrade over the Griffin 22. Топовый бак, брал в пару к Висмеку РХ 2/3. Топ, он и есть топ, все четко, ничего не течет (при правильной укладке ваты), вкуса более чем, навала хватает, это уже второй мой Гриффин 25 плюс, первый был черного цвета) Я очень доволен, рекомендую! Хорошо передает вкус за счет кеннеди-подобного обдува. Велосити стойки, очень большие отверстия, большое расстояние между стойками. Отверстия для заправки просто огромные - можно лить из ведра. Vorab-das Ding ist der Hammer! Riesen viel Platz für Wicklungen aller Art und das neue Juice control System hält was es verspricht. Extrem einfach zu handhaben und kein Gefummel mehr (im Gegensatz zum Griffin 25) mit der Watte. Nicht ein Tropfen vom Liquid tritt durch die Airflow aus und - Geschmacklich der beste Verdampfer den ich je hatte. Tolle Verarbeitung, extrem einfache Handhabung und super Geschmack-was will man mehr…. - Riesen viel Platz für Wicklungen aller Art und das neue Juice control System hält was es verspricht. - Extrem einfach zu handhaben und kein Gefummel mehr (im Gegensatz zum Griffin 25) mit der Watte. - Tolle Verarbeitung, extrem einfache Handhabung und super Geschmack-was will man mehr. - Nicht ein Tropfen vom Liquid tritt durch die Airflow aus. - Geschmacklich der beste Verdampfer den ich je hatte. It is shipped from China warehouse and EU warehouse. Our product accessories are not sold separately. Hi, I have a question regarding to the return policy of yours. Hence our custom (Turkey) "could" not allow the import of the product would you do a repayment? is this an authentic or clone device? Hi. 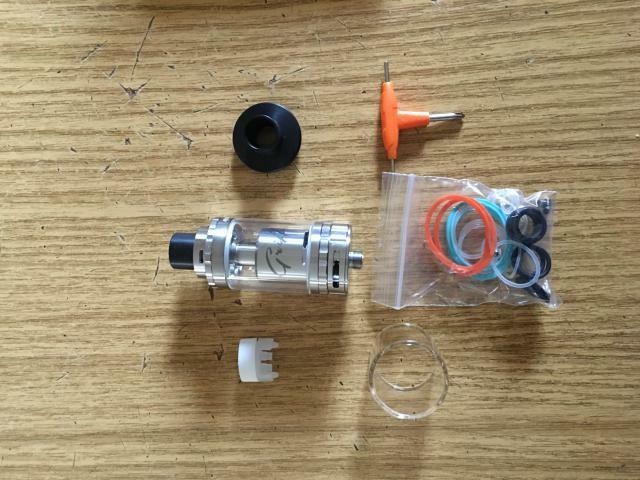 Does this product include and the original spare parts (replacement glass, 510 drip tip adapter, bag with o-ring and tool)? Hi dear. Can you write and send $ 20 to this product's voucher? I will pay $ 30.92. I want you to be in trouble with customs... I have to pay customs tax on orders over $ 30. That's supposed to be worth less than $ 30. Hi , Have stock ( griffin 25 plus black ) ? hello .. Do you send this product to Turkey ? When you check out, you will see the option for thispping method. Hello,what is all included in the Set? Package Contents: 1 x GeekVape Griffin 25 Plus RTA Atomizer . It only comes with a GeekVape Griffin 25 Plus RTA Atomizer.